Tim Tebow defeats North Korea’s Kim Jong Il. This headline had to be written after a weekend of fever high Tebow headlines and with the latest news that the world’s worst dictator Kim Jong Ill of North Korea has died. In regards to Tebow mania, last week you had students being suspended for Tebowing in the hallways, Rick Perry comparing himself to Tebow during the Iowa Presidential Debate and Jockey (Tebow’s sponsor) announcing they would give away $1 Million in underwear if Tebow won the Super Bowl. Yesterday, you had news outlets like the Drudge Report making his game against the Patriots the #1 headline story. When Tebow lost to Tom Brady’s New England Patriots, Drudge changed their top headline to “God loves Brady too”. Tebow fever concluded yesterday with The Oregonian’s John Canzano on KGW Sports Talk giving one of the most spirited defense of an athlete when he spoke about Tebow and his hopes for his future. 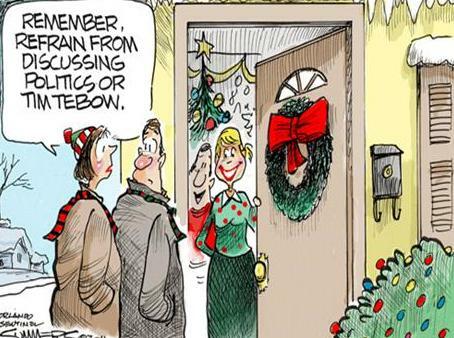 You have sports, religion and politics all mixed into one volatile mix. Is it just me, or is Tebow mania heading for a crash? I would like to get your opinion.